There are several ways you can improve your local search ranking on Google, as well as gain greater visibility in Google Maps search results. Depending on how well you execute, your business may even end up being featured in Google’s local 3-pack or Google Maps Pack, which can then result in more store visits and sales and increased traffic and revenue. Local search on Google comes in different shapes and sizes, and results are displayed in various ways across Google Maps and Google Search. For example: if you search for “Indian food” using your mobile device or laptop, local results appear, offering a list of nearby businesses relevant to the “Indian food” search query. These results may point to the Google listings of great Indian restaurants in the neighborhood, or they may lead to third-party listings and review website profiles, such as a business’ Yelp, Zomato, or Facebook Page or TripAdvisor Business profile. What is Google Maps Pack or the Local Pack? One of the most prominent and sought-after positions in Google’s local search results is the Google Maps Pack. Also commonly known as the “local pack” or the “3 pack,” Google Maps Pack is a set of three highlighted Google-Maps-based results (it used to be seven) featuring the most highly ranked businesses based on the factors that determine local ranking. As you can see, Google provides crucial information about each of the businesses organically featured in the Google Maps Pack: overall ratings, a short business summary, location address, business hours, price range, etc. — plus a featured photo on the right side. The “local pack” or “3 pack” is also displayed above traditional text-only or links-based search results — making it one of the most valuable pieces of online real estate across any platform. In fact, according to research, the Google Maps Pack grabs as much as 44 percent of the total clicks on search engine results pages. So how do you work towards making an appearance in Google Maps Pack search results relevant to your business? And what can you do to keep improving your local search ranking on Google, so that you can attract more people and drive more business to your location? One of the fundamental ways you can position your business to appear as part of the local pack is to claim your business listing on Google and manage your information using Google My Business. Use your actual business name, but don’t stuff it with keywords or your city name. Correct inaccuracies or errors in your data, and get rid of any duplicate listings. Be as detailed as possible when entering your business information. Include your business name, category, map location and service area, phone number, website URL, hours of operation, etc. Write original and compelling copy for your Google My Business description. Use a local number instead of a toll-free number. At all times, make sure your information on GMB is correct, complete, and up-to-date. Remember: business listings that have been claimed and are regularly updated on Google My Business — and which also boast of strong reviews and ratings — are the ones most likely to rank at the top of local search and be featured in the Google Maps Pack. Consumers depend on reviews to find great businesses from local search. That’s why reviews are heavily factored into the way Google approaches search and Maps Pack rankings: they add another dimension of trustworthiness to a business. With all else being equal, a business location with more (and better) reviews on Google and other review sites is more likely to be featured in the local 3-pack than a business with fewer or no reviews. Get more reviews. It therefore comes as no surprise that generating new reviews has become a go-to Google Maps Pack strategy for local businesses and marketers. 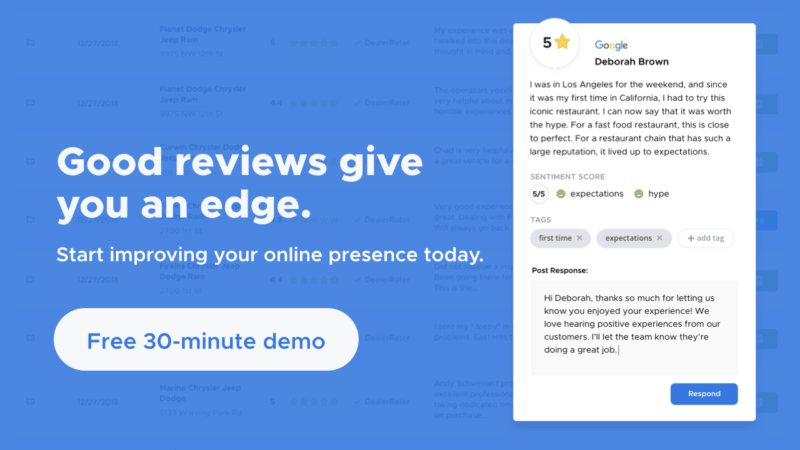 Here are 7 surprisingly effective ways you can get Google reviews. Apart from the impact that they can have on Maps Pack rankings, strong reviews and high ratings also help create powerful social proof for inspiring consumer confidence, converting organic search traffic, and driving sales. Not only do they help you get found more easily; they also influence searchers to click. Respond to reviews. Apart from requesting customers for reviews, you should also make an effort to respond to existing reviews of your business location on Google and other review sites. After all, local searchers and customers care about being responded to. 53 percent expect a review response within 7 days. But as much as 63 percent say that they have never heard back from a business after leaving a review. Your review responses can immediately improve consumer perceptions of your business; on the other end of the spectrum, not responding can be seen as actively ignoring the voices that matter the most: your customers. Don’t be intimidated: “citations” simply refer to mentions of your business name on the Web, along with other key information, with or without a link back to your website. Citations include your business listings on online directories like the Yellow Pages and Citysearch, social media sites like Facebook, Twitter, and LinkedIn, local search engines like Google, Bing Places, and Yahoo Local, online review websites like Yelp and TripAdvisor, local business discovery apps like Foursquare, or even local blogs highly associated with a particular city or geographic location. Like on Google My Business, consistency in the way you provide local business information matters. It’s one of the secrets to successful citation work. Chances are that you have already applied basic optimization techniques on your website. But gaining better Google Maps Pack positioning through on-site SEO is another story. If you’re managing only one business location, it’s useful to structure and expand your website in ways that improve your local search signals. For example, you can try to make sure that your business Name, Address, and Phone Number (NAP data) is present on every page of your website. You can also add unique and relevant local content, such as your location’s unique business description, operating hours, an “About Us” section, local news, deals, and promotions, information about the team or staff, customer reviews and testimonials of your business location, and other types of information that you think will be relevant to local searchers. Finally, you can embed a Google map on your site. A lot of businesses place this on their Contact page or About Us page. This is another way to telling Google that your business is located where your listings says it is. Remember to use the exact same address that you have on your Google My Business listing. Even small businesses can achieve better Maps Pack positioning than large chains, especially if they’re able to sustain a high level of engagement in the local community. Connecting with the local chamber of commerce and relevant business networks, partnering with non-competing local businesses and online communities, and participating in fairs, charities, and fundraisers can help get your business noticed. This kind of involvement then improves your chance of being mentioned by community stakeholders and gaining strong citations: one of today’s all-important local search signals. Simply put: community engagement helps you build local authority and ensures that the online footprint of your business reflects strongly where you’re located. Google has recently implemented a button to tap that will call the business, so there is less need for mobile users to see the phone number. However, they would want the address to put into their navigational app. There are a few broader changes Google made as well. For example, Google+ is no longer as important to page rank. This is a reflection of the fact that Google+ is just not very popular. The SERPs still tend to display star ratings from reviews on G+ pages, but having an active G+ account is not a big determinant of ranking anymore. Being active in local search directories is, however.